* best = entertaining, informative, etc. Almost everyone has heard of Salvador Dali, the crazy artist, mostly associated with melting clocks and a silly moustache. The genius that is Dali goes much deeper though. Dali was not only a painter but an artist of many talents, and perhaps one of the most intriguing things about him was his perfect awareness of one of the biggest secrets of success. It is often said that Dali was a self-proclaimed genius, which although not false, isn't the entire truth either. Dali was a master visualizer, who took bold actions without a shred of any evidence nor assurance, while not in the least lacking complete confidence, and in the end, he usually got what he previously so boldly announced. Dali's life was an experimentation and a game of possibilities. His spirit may have pulled him in various directions, but it must be understood that whatever his endeavor or obsession was at the time, the spirit of Salvador Dali was always vibrant and alive. As such, his legacy lives on today and into the morrows. 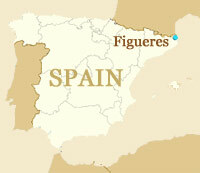 Born in the North-East corner of Catalonia, Spain, in a town called Figueres, the life of young Dali had a bizarre touch to it, as he was not the first Salvador to his parents. 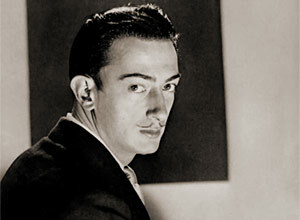 His older brother was born 3 years before him and died 9 months before the Salvador Dali we know was born. At the age of 5 he was taken to his brother's grave and explained by his parents that he is his brother's reincarnation. He accepted this. Salvador Dali also had a 3 years younger sister, Ana María, with whom he was close at first. She also acted as his model for a while. One of the earliest paintings by Dali is "Landscape near Figueras", from 1910, when he was about 6 years old. It was painted in oil on cardboard and is merely 14 cm x 9 cm (51/2 in x 31/2 in) large. According to Dali, the "greatest blow" he experienced in his entire life was at the age of sixteen, when his mother died of breast cancer. When Salvador appeared in the Madridian Residencia de Estudiantes (students' residence) in 1922 he already demonstrated some of the eccentric marks of The Salvador Dali. His hair was too long, he wore sideburns and a rather unusual attire. The movie Little Ashes nicely illustrates his appearance at the students' residence. Have a look. Excerpt from "Little Ashes" (2008). Dali is portrayed by Robert Pattinson. It was there and in that time that Dali made some of the most influential friendships of his life, the most prominent being Pepìn Bello, Luis Buñuel, and Federico García Lorca. In this period Dali experimented with various styles, but mostly Cubism and Dadaism. 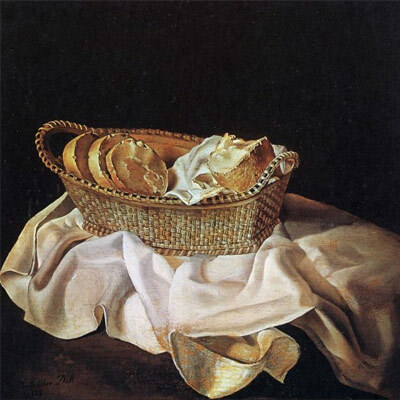 He also showcased artistic craftsmanship in a more realistic style, such as The Basket of Bread painting (see below). In 1926, shortly after his first visit to Paris where he also met Pablo Picasso, Dali was expelled from the Academy due to his proclamation that nobody there was competent enough to judge him. The thin curved moustache, which was to become one of Dali's trademarks, also first appeared in this time. It was inspired by Diego Velázquez, the Spanish master painter from the 17th century. Salvador was lucky to have found his muse fairly early in life. In August 1929, at the age of 25, Dali first met Gala, who was at that time married to Paul Éluard, a French poet and one of the founders of the surrealist movement. Gala, born as Elena Dmitrievna Diakonova, was originally from Russia and moved to Paris in 1916 in order to be with Éluard. Excerpt from "Dali" (1991), starring Lorenzo Quinn as Dali. Before meeting Dali at Costa Brava, Gala already inspired various artists, such as Louis Aragon, Max Ernst, André Breton and Paul Éluard. From 1924-27 she lived in a ménage à trois with Ernst and Éluard. When Dali and Gala, who was 10 years older than him, met, they very soon started an affair, and her marriage with Éluard was broken up. Gala always detested motherhood, so with the divorce, her and Éluard's daughter Cécile naturally stayed with the father. 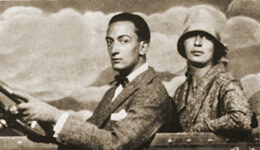 Éluard and Gala remained close friends. Gala immediately become Dali's muse and greatest inspiration, and she was by his side from that summer on. Gala was frequently a model for his paintings, depicted either as a woman or a religious figure, such as the Virgin Mary in The Madonna of Port Lligat paintings. Dali's love for Gala is conspicuously evident and could be observed and admired by the whole world through many of his paintings. Dali's creations in 1929 and in the 1930s include some of his most famous works, such as The Enigma of Desire: My Mother (1929), The Great Masturbator (1929), The Persistence of Memory (1931), Eggs on the Plate Without the Plate (1932), The Enigma of William Tell (1933), The Phantom Cart (1933), Face of Mae West Which May Be Used as an Apartment (ca. 1935), The Anthropomorphic Cabinet (1936), Soft Construction with Boiled Beans - Premonition of Civil War (1936), Three Young Surrealistic Women Holding in Their Arms the Skins of an Orchestra (1936), The Burning Giraffe (1937), Sleep (1937) and many more. Dali and Gala had a civil marriage ceremony in 1934, and much later, in 1958, remarried in the Àngels chapel, near Girona, Spain. Surrealism is a cultural movement that started in the 1920s. The artists themselves consider the Surrealistic works as expressions and artifacts of the philosophical movement. The writer and poet André Breton was the founder and leader of the Surrealism. In his words Surrealism was, above all, a revolutionary movement. He further defined surrealism as "pure psychic automatism, by which an attempt is made to express, either verbally, in writing or in any other manner, the true functioning of thought. The dictation of thought, in the absence of all control by reason, excluding any aesthetic or moral preoccupation." Politically, surrealism was leftist and also associated with communism and anarchism. 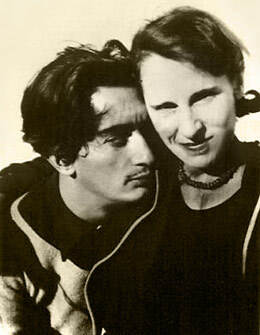 1929 was a significant year for Dali, and not only for meeting his muse and future wife. It was also the year of his collaboration with his friend and film director Luis Buñuel on Buñuel's movie Un chien andalou, as well as the year in which he joined the Surrealist group. The following year Dali helped with another of Buñuel's movies, L'âge d'or (The Golden Age), and his book La femme visible (The Visible Woman) was published by Éditions Surréalistes. Dali developed the Paranoiac-critical method, a surrealist technique which he used in his paintings and other works. André Breton commended the method and called it an "instrument of primary importance". "I have been inclined to regard the Surrealists as complete fools, but that young Spaniard with his candid, fanatical eyes and his undeniable technical mastery, has changed my estimate." In the 1930s the majority of Surrealists had strong political views, traditionally leftist, and the apolitical Dali didn't fit in anymore. 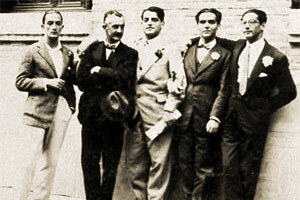 In 1934 there was a "trial" among the Surrealists which resulted in Dali's expulsion from the group. 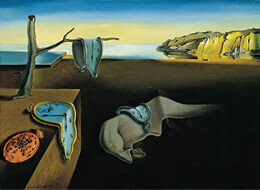 The famous line "I myself am surrealism" was Dali's reply to being expelled by his colleagues. In 1939 Breton rearranged Salvador Dali and came up with an anagram Avida Dollars, based on the French avide à dollars which means as much as eager for dollars. Many surrealists critisized Dali for the increased commercialization of his work, and some even went as far as to talk of Dali in past tense only. Regardless of criticism, Dali's work withstood the odds and challenges of time and remains as an undoubted monument of Surrealism. 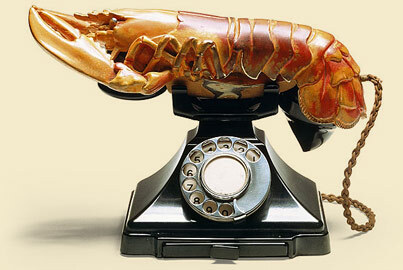 Additionally to his paintings, Dali's Lobster Telephone and the Mae West Lips Sofa are considered eternal icons of the Surrealist movement.